Four-time world champion in two divisions and #2 ranked BRIAN “The Hawaiian Punch” VILORIA, (38-5, 22 KO’s) of Los Angeles, CA via Waipahu, Hawaii will challenge undefeated and #1 ranked ARTEM DALAKIAN, (15-0, 11 KO’s), of Dnipropetrovsk, Ukraine for the vacant WBA Flyweight World Title taking place prior to the HBO Boxing triple header telecast at SUPERFLY 2 set for Saturday February 24, 2018, at the Forum in Los Angeles, CA, it was announced today by TOM LOEFFLER of 360 Promotions. Previously holder of the WBA Flyweight World Title, Viloira thrilled the fans at the initial SUPERFLY event, stopping Miguel Cartagena in the fifth round on September 9 at the Stubhub Center. Among the notable victories on Viloiria’s ledger throughout his illustrious career are Hernan Marquez, Giovanni Segura, Ulises Solis, and Angel Priolo. He has also previously held the WBC Junior Flyweight World Title, the IBF Junior Flyweight World Title and the WBO Flyweight World Title. 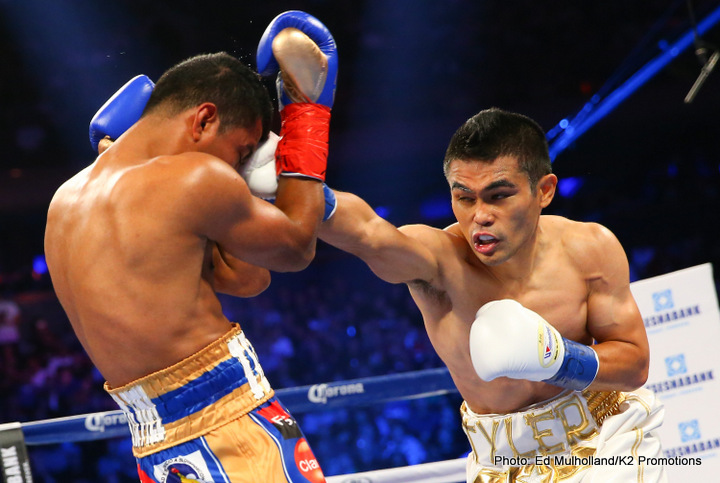 In an epic battle at The Mecca of Boxing, Madison Square Garden on October 17, 2015, Viloria would challenge then #1 Pound-for-Pound Fighter and WBC Flyweight World Champion Roman ‘Chocolatito’ Gonzalez losing valiantly in a battle that had the sold-out crowd on their feet throughout. Having fought exclusively in Ukraine since turning professional five years ago, the 30-year-old Dalakian won the vacant WBA Continental Flyweight Title on July 17, 2015 with a 12-round decision victory over Angel Moreno Kiev, Ukraine. The heavy-handed Dalakian has defended his title four times, all victories by knockout. Most recently he stopped Luis Manuel Macias in the sixth round on April 22, 2017 in Kiev. Co-featured on the HBO Boxing After Dark telecast beginning at 9:30 p.m. ET/PT, former WBC Super Flyweight World Champion, CARLOS “Principe” CUADRAS, (36-2-1, 27 KO’s), of Mexico City, MX facing hard-hitting, two-time world title challenger MC WILLIAMS ARROYO, (16-3, 14 KO’s), of Fajardo, Puerto Rico in an outstanding ten round super flyweight clash. Tickets for SUPERFLY 2, priced at $250, $150, $100, $60 and $30 are now on sale and can be purchased through Ticketmaster (Ticketmaster.com, 1-800-745-3000) and the Forum Box Office. The Forum is located at 3900 W. Manchester Blvd, Inglewood CA 90305. Doors will open at 4:30 p.m. on the night of the event. SUPERFLY 2 is presented by Tom Loeffler’s 360 Promotions in association with Nakornluong Promotions and Zanfer Promotions. Cuadras vs. Arroyo is presented in association with Promociones del Pueblo and PR Best Boxing. Viloria vs. Dalakian is presented in association with Teiken Promotions.